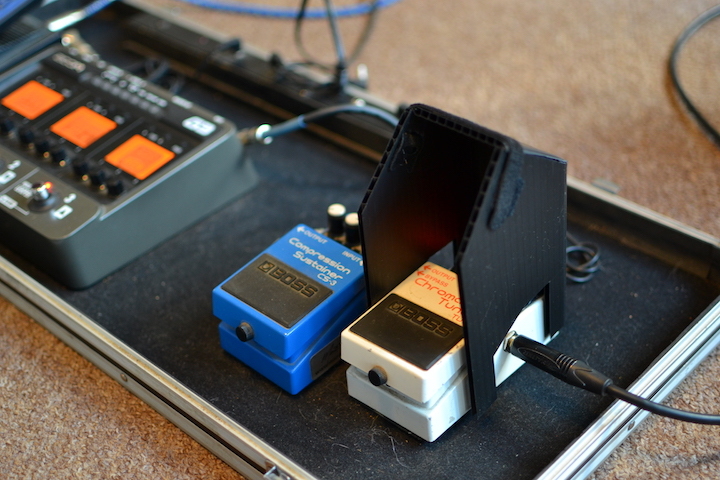 As a musician, are you frustrated with not being able to see the display on your pedals in bright sunlight? Finally a simple solution to a age old problem. Meet the Pedal Shade™! Designed to fit over the Boss™ series of pedals, the PSB1 comes with cutouts on three sides for cables and power. Lays flat when not in use. Just fold and fasten one Velcro™ strap (included). Fits all BOSS® Compact pedals or equivalent. The shade is 100% durable plastic and will withstand rain! Ships flat and user folds to assemble. Order as single, 3-Pack, or a 5 pack. Shipping is only $2.50 for 1 pack or 3 pack, $3.50 for 5 pack. Ships via USPS First Class mail to USA 48 States Only. International customers should contact us for a quote.